This is a another MGFTW project ~ MacGyver For The Win! You know, when something is creating a problem and you totally MacGyver a solution? MGFTW! OK, what’s wrong with this picture? I’m not taking about the photo ~ I’m talking about what’s in the picture. 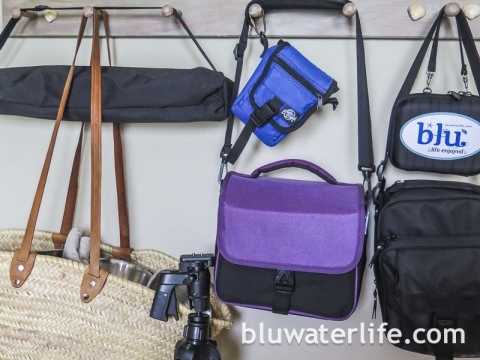 My photography equipment is separated into different bags for different set-ups. 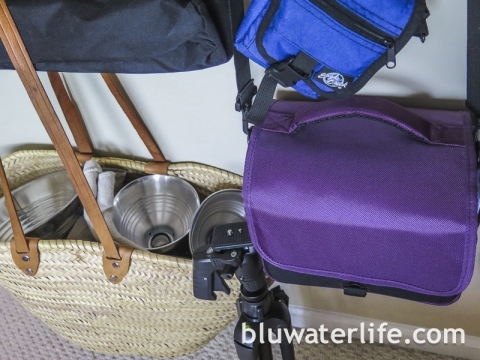 Everything has its own bag ~ except for the tall tripod. I tend to drop things, so having everything in a carry bag is a requirement. 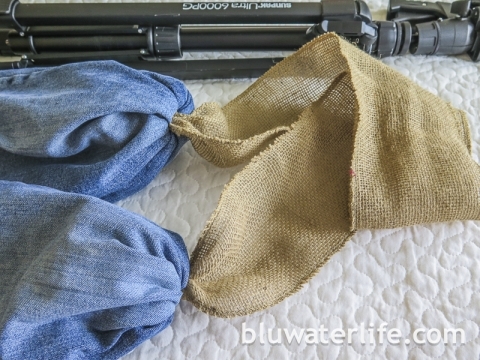 I need to order a tripod carry bag, but when I needed one in a hurry, I created a DIY tripod carry bag in under 15 minutes. This idea would also work for a yoga mat, a collapsible chair or rolled beach blanket. 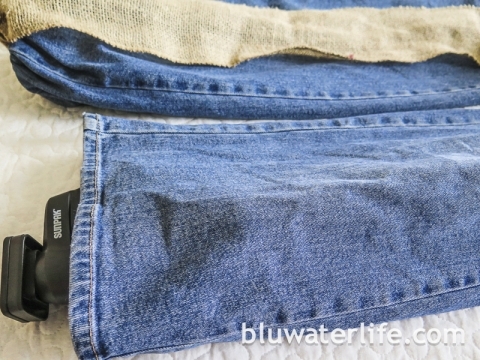 There’s no sewing or gluing, and it starts with an old pair of bootcut jeans. 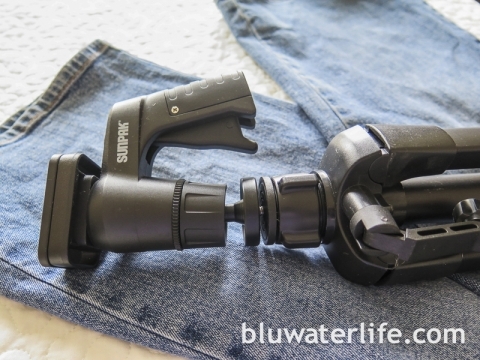 Cut the legs off the jeans, 4 or 5 inches longer than the item to carry. 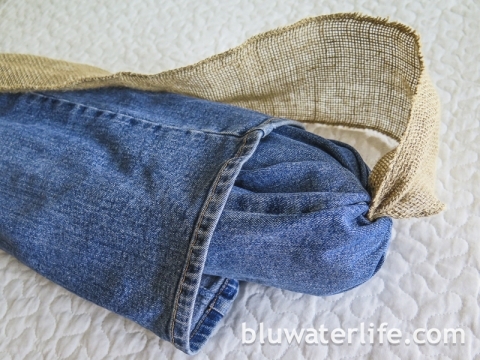 Cut a piece of something to use as a carry strap, like strong cord or wide seam tape ~ I used some wide burlap ribbon. A strap roughly 38″ long works for me. 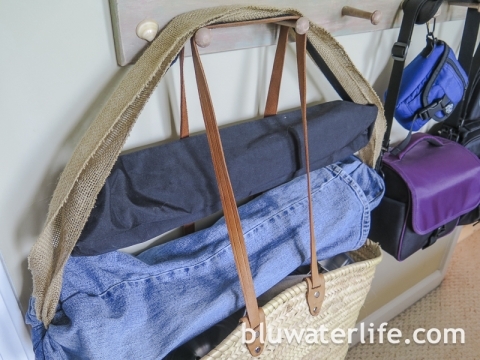 You can go longer or shorter for a strap depending on your height. Measure from your shoulder to elbow, and triple the measurement for total length. OK, here’s the how-to! Turn the jean legs inside out. Thread the carry strap through the finished end of the jean leg and out the cut end. Repeat with the other leg. Tie a good-sized knot at each end of the carry strap. 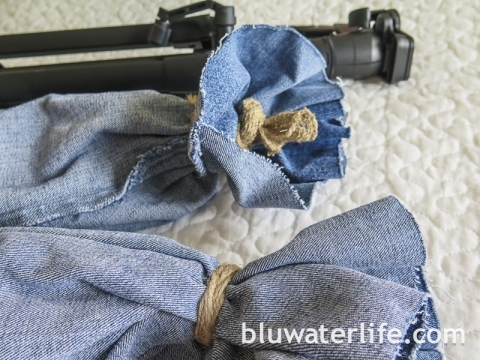 Gather the cut end of the denim just under the knot and wrap with some yarn, twine or something similar, then tie it off tightly. Pull the carry strap from inside the leg to snug the knot against the gathered end. 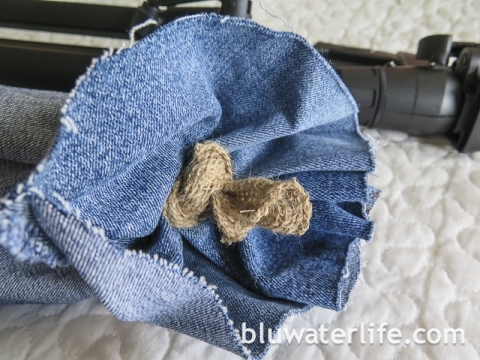 Trim the gathered material if needed, but leave a couple of inches to pad the knot and the inside ends of the bag. Turn the jean legs right side out, and the carry strap is now attached on the inside of each leg. Then slide the other leg over the first leg, in the opposite direction. There’s enough friction between the fabric layers to hold them in place for a horizontal carry under the arm, which is how I carry my bag. To carry vertically, you will need to tie a cord around the center so the legs do not slide apart. This works well for me. The extra fabric inside the ends actually pads the tripod adjustment hardware, and two layers of fabric protects the rest of the tripod. 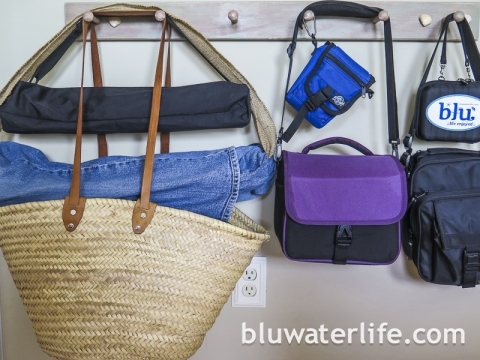 I can carry the straw tote with clamp-on lights, and two tripod bags under-arm on one shoulder ~ leaving the other shoulder available for a camera bag. 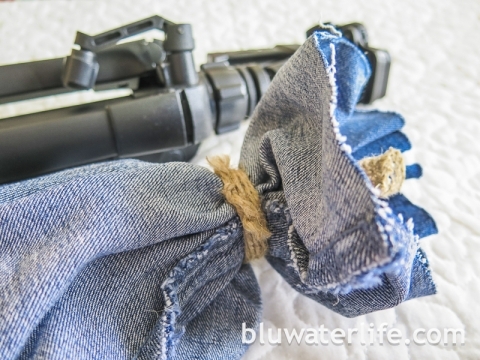 Check out another MGFTW project ~ my DIY knife roll bag. I may get around to ordering a zipper bag for my tripod at some point, or I may just continue to use my DIY tripod carry bag! hang a mirror? easy peasy! Amy Howard ~ one step paint ~ tips! Hey Bobbi – great way to work out a solution! Can’t wait to see your vacay photos…have a wonderful adventure!